Technology surrounds us and has become an inevitable part of our lives. Just like other industries, technology has also had a significant impact on the health and fitness industry. Innovations in the fitness industry have changed the way we workout resulting in substantial transformations. Wearables are increasingly gaining popularity by the day. They are not particularly new, but they have undergone many changes in recent years to help physically inactive persons to become more active. In the past, wearable devices were bulky and ineffective. This is no longer the case. Today’s wearables come in various forms such as smart wristbands, headbands, eyeglasses, etc. You can easily strap them onto your wrist, clip them on your clothes or even rock them like jewelry. 1 in 6 consumers currently owns and use a wearable device according to Forbes. In 2016 alone, a whopping 118 million units of wearable devices were shipped, and industry experts believe that this trend is not stopping any time soon. Very soon, wearables will overtake smartphones to be best-selling consumer electronics products. Projections show that the wearable device market will quadruple by 2022. Smart wearable sales are projected to exceed 200 million units in 2020. A wearable is an electronic technology incorporated into items of an accessory and/or clothing which can be comfortably worn on the body. 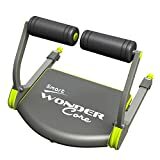 It is designed so as not to obstruct with your body when you are working out. These amazing tiny gadgets are developed considering the ease of application, data security, accuracy and cost. They allow you to access advanced technologies in a portable, easy and hands-free manner. Wearable devices have sensors that monitor a wide range of biometrics (bodily systems and functions) in real time. They collect raw data that is afterward fed to software for analysis. The data is transmitted via wireless networks to cloud storage facilities. The connectivity provided by these devices delivers easily accessible and understandable feedback in both directions. Companies like Misfit, Fitbit and Garmin are leading the race for fitness trackers. Mostly wrist-worn, these workout companions monitor fitness-related metrics like heartbeat, calories burned and steps taken. These trackers are intended to fit into your life, and not disrupt it. Gyms and smart fitness companies are continually looking for ideas to tap the digital world market to give their businesses the edge over their competitors. They are aware of the fact that clients don’t want to get the feeling like they are making a lifestyle change. To enable this, fitness centers have started integrating wearables to reach potential clients and enhance membership retention. Wearables provide vital data, socialization and gamification aspects. Just like smartphones have revolutionized how we communicate with the outside world, wearables continue to become more deeply woven into the fitness experience. In today’s market, wearable devices provide sensory and scanning features such as tracking physical activity and scanning. They facilitate communication between a trainer and a trainee. Technology is advancing at a fast pace, and developers and engineers continue to find new and exciting software and hardware innovations that will change how wearables look, feel and work. It is safe to say that there’s no limit to the potential uses of wearable devices. Fitness centers that integrate wearables into personal training sessions and group classes have a better retention rate. By using the social platforms associated with wearables to connect gym members, the gym will start feeling like a social space for members and gym-goers can start feeling like a family instead of just training partners. The info from these devices is vital when looking to send training tips, class reminders and push notifications. Gone are the days when gyms used to rely on traditional physical records to keep track of their customers’ progress. Thanks to wearables, gyms can take advantage of the valuable data generated by the devices to extract value from members. Breaking down the data will help gyms to learn customer behavior and act accordingly. If, for instance, you pinpoint a member that is likely to quit, you can devise ways to keep them engaged. Engagement can be anything from a simple consultation to a free personal training session. Workouts don’t need to be boring, and thanks to wearable fitness trackers, they are not. You can sync up your device with your fitness center’s ecosystem to enable gamification. What this basically means is that any gym activity, be it weight lifting or group exercise, will turn into a game. You will be offered personalized points or rewards for every successful milestone. This will engage gym-goers and motivate them to do better and be better. When your goals seem far-fetched, you will get the required motivation to reach for them. It is easy to overrate your daily level of physical fitness. Wearable devices can be linked with apps that can monitors members’ diets and activities outside the gym over time. Every wearable has a mobile app to go along with. Such apps can help you keep your client on track by ensuring he or she sticks to the training program. Besides tracking, wearables also provide feedback and helpful insights. Depending on the client’s progress, you can make meaningful changes by offering the appropriate support and guidance. In the next few years, every fitness club will have its own app, just like every business now has its own website. We live in an internet era and social media rules the world. Almost everyone is on Facebook, Instagram and Twitter. Wearable devices bring out the social feature in a gym, enabling members to connect easily. By making exercises social, gym-goers are more likely to enjoy the experience of training in the gym and sticking to their unique personal fitness goals. Overall, fitness is headed towards smart wearable tech and the cutting-edge tech currently available has set the pace for a more personalized fitness planning. The wearable market is in a constant state of change. While most common devices are worn on the wrist, evolving wearable designs means that smart technology will be incorporated into other gears such as running clothes and shoes. These advancements have made the future of fitness bright and exciting to look forward to. Think of wearables as a New Year’s resolution and acquire one today! HOLISTIC HEALTH: Instantly learn 12 insightful measurements of your body's health, such as Weight, Body Fat, BMI, Bone Mass, Muscle Mass, and more. KNOW YOUR BODY: The EufyLife app automatically records insightful health data. Progress and health trends are traced automatically over time. HIGH ACCURACY: Two pairs of super-sensitive sensors ensure precise and correct measurements. FDA-listed for complete reliability. 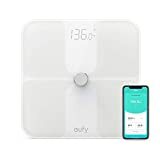 FOR THE WHOLE FAMILY: Up to 20 accounts, each with multiple, users can track their health measurements and large 1.25'' numbers are easy to read for all ages. 【Smart Gift for You and Lovers】: This is a new upgrade smart watch with so many function, easy to use. It is suitable to any age persons. We will offer you LIFETIME WARRANTY of our smart watch, purchase it without any worries. Our bluetooth smartwatch is your best choice, you won't regret. Go and get your lovers a big surprise! 【Two Working Model】: Use as an Android Phone: If you install a GSM 2G/2.5G Network SIM Card into the smart watch, you can make phone call directly from the smart watch, including answering and dial-up etc.. Bluetooth Smart Watch: If not put SIM card, you can connect watch with phone by bluetooth, then you can make phone call, including answering and dial-up, view and reply text messages and so on. 【Multi-Function】: Dial via smart watch SIM or Bluetooth optional, Pedometer, Sedentary remind, Sleep monitoring, Remote photos, Music playing, Alarm clock, Two-way anti lost remind, alarm clock, voice recorder, muti-timezone, muti-language, daylight saving time and notification push including facebook,twitter, email,calls,texts,etc.For ANDROID,all functions can be used. For IPHONE,the smartwatch supports Partial Functions. 【ANDROID AND IOS COMPATIBLE】: This smart watch can support most android and ios phones. Such as iphone X/8/8 plus/7/7 plus/6/6 plus/6s/6s plus/5/5s/se (Only Supports Partial Functions), Samsung Galaxy Note8/s8/s8 plus/s7/Note 5, Google Pixel/Pixel XL, HTC, Sony, LG, HUAWEI, ZTE etc. smart phones. 【LIFETIME WARRANTY】: 100% Satisfaction Guarantee, Free return within 90 days. If you are not 100% satisfied with the smart watch, we will replace it for you or simply return it for a full refund no questions asked. We promise you every quality smart watch and friendly customer service. Multifunction Smart Watch: The fitness tracker smart watch has data and 12/24H time display, Accurate heart rate, Blood pressure monitor, Sleep monitor, Auto pedometer, brightness adjustment, Weather, Clock alarm, Stopwatch, Sedentary reminder, Remote camera control, Music control, Find phone, Incoming call and SMS reminder, Message reminder etc. 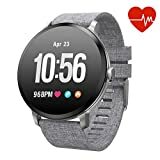 Heart Rate Monitor & Blood Pressure Fitness Tracker: Enter the watch face and long pressing the control area. Wait a moment about 30 seconds, then you can read the real time heart rate/blood pressure/blood oxygen data in the watch face. You can set the automatic heart rate monitor in the app. 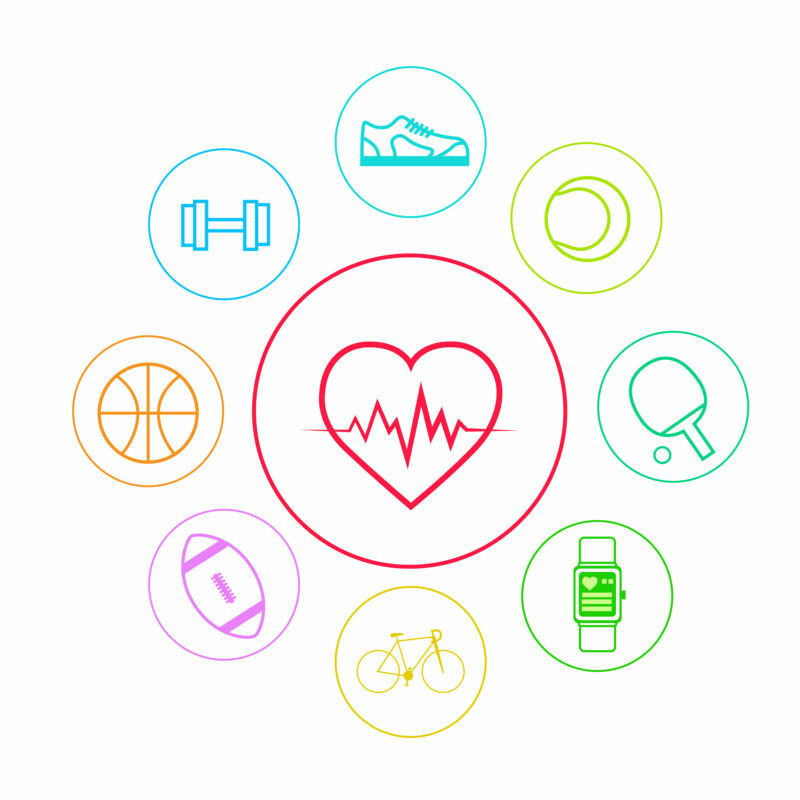 The history heart rate, blood pressure and blood oxygen details data are Available in the app. See Calls & Messages on Your Wrist: Receive call, SMS and SNS (Facebook, WhatsApp, LinkedIn, Instagram, and Twitter) notifications on display; Support system iOS 9.0 or above, Android 4.4 or above. (not for PC, iPad or Tablet). Special Powerful Functions and Warranty:Weather forecast function, Music Player, Remote Camera Function, Change the Screen Brightness function and more other functions are available. 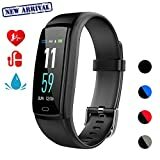 3-Months Warranty is Provided by Teamyo fitness tracker. Please feel free to contact us if you have any problem about our product, and we will response to you as soon as possible with full enthusiasm. 【Smart Temperature Sensor&LCD Touch Screen】 - Finger slids through the lid, LCD Screen will display inside temperature.Different color lamp rings represent three ranges of temperature.No need to test temperature by mouth, avoid burns. 【2Hrs Alarm Reminder&Expired Water Reminder】 - Designed to remind you to drink water regularly or take medicine on time. Foladion smart bottle also has expired water reminder function, help you develop healthier water consumption habits.No need smart phone or Bluetooth, easy to operate. 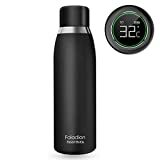 【Double Walled and Vacuum insulated&Durable Quality】 - Foladion smart water bottle is made of premium food grade 18/8 stainless steel, dustproof, waterproof and antirustnon-rusting.Good Sealing, even filled with ice or boiling water, it won't sweat or get hot to the touch and easy to clean. 【BPA-Free Safeguard&Large Capacity】 - It is healthier than plastic or glasses water bottle.The size of insulated water bottle is 17oz, large capacity to fit your daily hydration needs. You can also store ice, coffee, milk, beer, drinks, etc. Best Birthday or Festival gift for family or friends. 【Magnetic Charging&Easy to Use】 - Fast charging, 1.5 hrs to fully charge, work time up to 30 days. Energy saving, eco-friendly! Suitable for easy travel, great to bring cold or hot drinks to all occasions like outdoor sports, office, beach, school, picnic, hot yoga, hiking, camping, cycling, running, walking, gym, fitness, etc. 【Smart Notifications】 Pair your fitness tracker with your smartphone by app and never miss any notifications while you're in the sport.Call & SMS Message Notification, APP Message Notification ( Facebook,Twitter, WhatsApp, Linkedin, Messenger... ), Sedentary Reminder, Alarm, Anti-lost, Find phone. 【All-day Activity Tracking】Accurately record all-day activities like steps, distance, calories burned, active minutes and sleep status.Connect with mobile's GPS, you can check your real-time route in the App. Other sports data and sleep data can be also checked in the App. 【Female Physiological Period Reminder】App is set for women when the function automatically turned on, truthfully set personal data and physiological status, only remember the menstrual period, pregnancy, mum period. The watch will be reminded according to different conditions. 【Longer Battery Life & Compatibility & Warranty】 Full charge requires only about 1 hour and the standby time can be 5-7 days. App supports smart phones with Bluetooth 4.0 or above(not for tablet). Support system:iPhone (not for iPad) iOS 8.0 above, Android 4.4 above(Samsung LG HTC Huawei etc).12 months Product Warranty and 7×24 hrs friendly customer service. 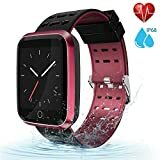 【Multifunction Smart Watch】4 stylish watch faces, newest 3 messages storage and read, 24 hour continuous heart rate monitoring, auto sleep monitoring (22:00pm-08:00am), turn on/off the watch, stopwatch, 8 sport modes, 5 clock alarms, sedentary reminder, step counter, calories counter, mileage, call reminder, SMS/SNS alert, remote shutter, find phone, target settings. 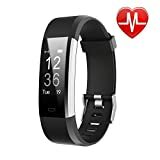 【Dynamic Heart Rate & Auto Sleep Monitor】moreFit fitness tracker monitors dynamic heart rate, uploading the real time data of heartbeats to WearHealth app. Also support automatic sleep monitoring from 22:00pm-08:00am, it records deep sleep, light sleep, stay up and awake states. All health data show as a chart, clearly acknowledge your physical fitness status at whole day/week/month. 【High-grade IP68 Waterproof & Longer Battery Life】This fitness tracker meets international IP68 high-grade waterproof and dustproof standard. The updated battery capacity up to 180MA that keeps watch's working time up to 5-7 days, and standby time up to 15-30 days after charging about 2 hours. 【8 Sport Modes Free Switching】Switch 8 different sport modes on watch directly. Built-in advanced 3D sensor and pedometer to accurately count your steps, calories burnt & distance achieved. Accurately record all-day activity. A variety of sports modes: Running , Walking , Climbing, Riding, Ping-Pong, Basketball, Badminton, Soccer. The APP will manage your personal data and help you achieve fitness goal every day! 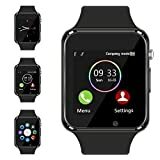 Multi-Function: This smart watch supports many functions: Dial, Message, Bluetooth, Remote Cameras, Alarm Clock, Step Counting, Sleep Monitor, Sedentary Reminder, Anti-lost, Music play recorder, Calendar, Calculator, Apps as Twitter and Facebook(need extra SIM card), App sync(for Android only) and so on. Synchro Function: Just scan QR code, download the BT APP, install and use the Syne software, then you can read SMS, view and reply text messages directly using the watch. The time and date, phone book, phone calling, musics playing and so on will be automatically synchronized. (APP does not support iPhone). 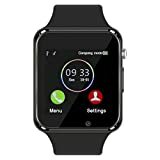 Super Compatibility: This Bluetooth watch can support most Android and iOS phones, such as iPhone X/8/8 plus/7/7 plus/6/6 plus/6s/6s plus/5/5s (Only some functions are supported), Samsung Galaxy S9, S9 Plus, S8, S8 Plus, S7, S7 Edge, S6, S6 Edge, S5, Samsung Note 8, 5, 4, Google Pixel/Pixel XL, HTC, Sony, LG, HUAWEI, ZTE etc. smart phones. Smart Gift for Family & Friends: This is a new upgraded smart watch with many functions, easy to use. Being used as a fitness tracker, it is suitable to any age parents, husband, wife, teenagers, families, and friends. We will offer you free return within 90 days, purchase it risk free!